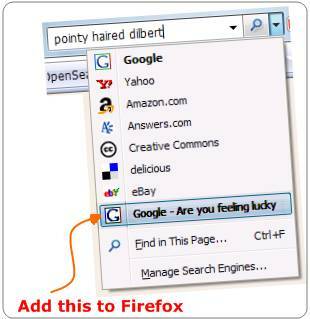 While trying to understand how the Mozilla firefox search plug-ins work [ more ] I got curious and wrote a search plug-in that will take you to the first Google search result directly instead of displaying the results pages, ie mimicking the “I am feeling lucky” searches. Feel free to download and install it. I just took the google.xml file in the searchplugins folder and added the line beneath the URL tag. This will tell Google that the button “I am feeling lucky” has been clicked and hence the search engine would redirect you to the first page of results instead of the results page. Cool eh?